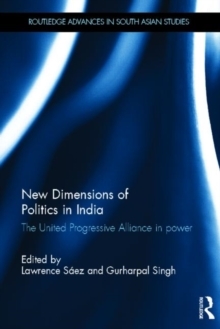 Following India's general election in May 2009, this book undertakes a critical evaluation of the performance of the United Progressive Alliance (UPA). It presents a thorough analysis of the UPA coalition government, and by providing an understanding of the new innovations in the UPA's policies, the book goes on to evaluate the effectiveness of these policies against their aims and objectives. This book suggests that there is an analytical framework for assessing the political consequences of the policies and the UPA's success, both at the national and state levels, with particular reference to new policies in governance, secularism and security. These three areas constitute important fault lines between the main national political parties in India, and provide an interesting point of departure to explore the new emerging trends, as well as the strong underlying continuities between the UPA administration and its predecessors. The book offers new insights into the structure of Indian politics, and is a useful contribution to studies in South Asian Politics, Governance and Political Parties.